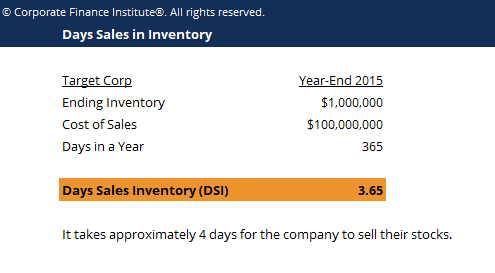 This days sales in inventory template will show you how to find average number of days or time required for a business to convert its inventoryInventoryInventory is a current asset account found on the balance sheet consisting of all raw materials, work-in-progress, and finished goods that a company has accumulated. It is often deemed the most illiquid of all current assets, and thus it is excluded from the numerator in the quick ratio calculation. into sales. Days Sales in Inventory (DSI), sometimes known as inventory days or days in inventory, is a measurement of the average number of days or time required for a business to convert its inventoryInventoryInventory is a current asset account found on the balance sheet consisting of all raw materials, work-in-progress, and finished goods that a company has accumulated. It is often deemed the most illiquid of all current assets, and thus it is excluded from the numerator in the quick ratio calculation. into sales. The days sales in inventory value is calculated by dividing the inventory balance (including work-in-progress) by the amount of cost of goods soldAccountingOur Accounting guides and resources are designed as self-study guides to learn accounting and finance at your own pace. Browse hundreds of articles on important topics such as the income statement, balance sheet, cash flow statement, depreciation methods, how to link the 3 statements, debits & credits, journal entries. This number is then multiplied by the number of days in a year, quarter, or month. Low days sales in inventory reflects fast sales of inventory stocks and therefore would minimize handling costs as well as increase in cash flow. High days sales in inventory value generally indicates either a slow sales performance or an excess of purchased inventory (the company is buying too much inventory), which may eventually become obsolete.